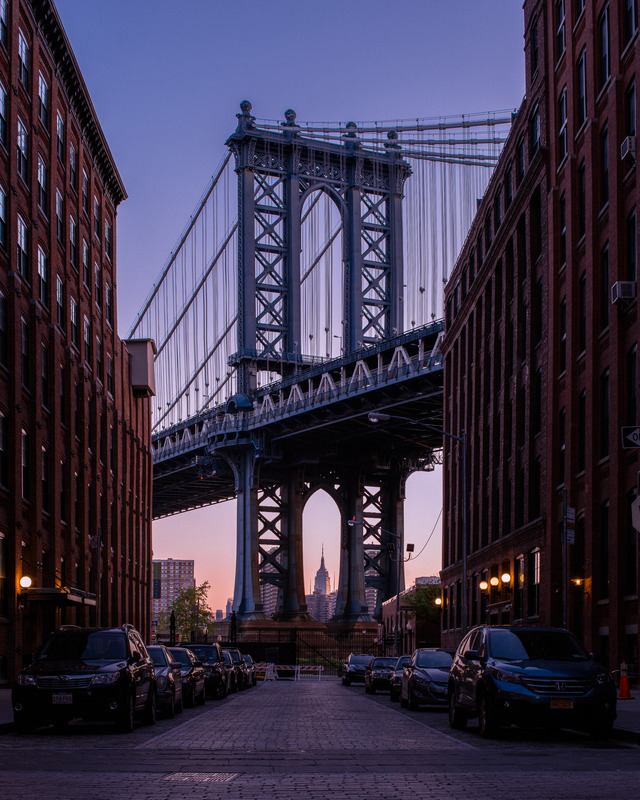 Directions: Although you can obviously see the Manhattan Bridge from both Brooklyn as well as Manhattan, this location is perhaps the most iconic and is Brooklyn in the DUMBO area. You can get access here by taking any number of subways to this area - the F train to York St, the A or C trains to High St or the 2 and 3 trains to Clark St. You can get here via the East River Ferry from Manhattan or other parts of Brooklyn. Of course you can drive and bike here too. The actual location is at the intersection of Washington and Front Streets. This is quite an iconic shot, and perhaps has been repeated often over the years. Some of the old photographs are perhaps the most fascinating as you can see the difference in the built spaces over time. Although the bridge is not the more iconic Brooklyn Bridge (which is right next to it), the Manhattan Bridge is just as important. This view becomes interesting by nature of how it aligns itself at the street intersection and the how the Empire State Building is framed through the structural supports. 1. New York city is a fascinating place at any time of day. You could shoot this at dawn or dusk, or even during the day when you can capture the dynamism of local street culture- be it the thousands of tourists who “happen” on this street or the local skateboarder kids. 2. That said, the exposure contrast may be too much during the middle of the day to expose for the ESB in the distance and the light never really falls too perfectly at dawn or dusk. Nevertheless, it is the form or the silhouette of the composition that is rather timeless. It is not a terribly busy street by New York standards so it is possible to get a window of time to snap a relatively empty scene. Thanks for the info. Is it possible to get a model out on to one of the closest pylons? Could she walk in shallow water or is a boat needed? 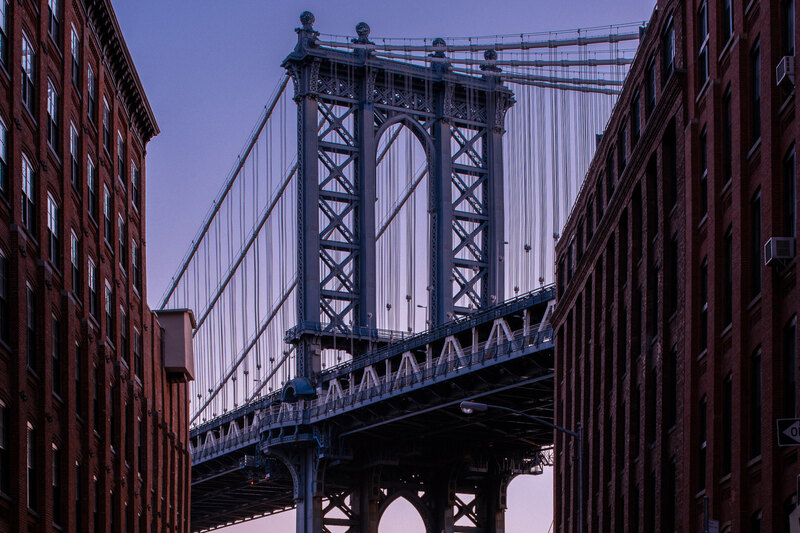 Any thoughts on the best time of day to photograph this iconic shot to clearly get the Empire State Building through the foot of the bridge? Based on 2 days in NYC, I’d say that your best shot would be at sunrise as the sun will brighten up that side of the ESB.